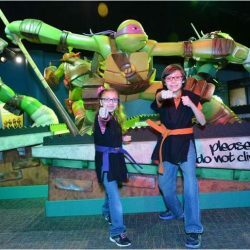 Art contest replicates interactive Teenage Mutant Ninja Turtles: Secrets of the Sewer exhibition at Reading Public Museum. Reading, PA…Reading Recreation Commission is holding an art design contest among City playgrounds and camps creating artwork using different media. Each playground chose one of four Renaissance artists, and is creating a piece of artwork that represents that artist : Michelangelo, Donatello, Leonardo DaVinci, and Raphael, which are also the names of the four Teenage Mutant Ninja Turtles, who are the feature of the Reading Public Museum’s summer exhibit. Children from all the playgrounds learned about Renaissance artists prior to the start of their design project, when they visited the Reading Public Museum and the summer interactive exhibit “Teenage Mutant Ninja Turtles: Secrets of the Sewer.” Each child’s artwork should reflect both the theme and an interpretation of their playground’s chosen Renaissance artist. For example, if Michelangelo is the artiest, kids chose to do a sculpture using soap or wire. The competition culminates in a reception at Reading Public Museum on Thursday, July 20, 2017 from 5:30 – 8:00 pm. The event is free and open to the public. Daphne Klahr, Executive Director of Reading Recreation Commission acknowledged that the design competition is not only fun, but a great learning experience as well. “This unique design and art contest encourages creativity and teamwork,” added Heather Boyer, Reading Recreation Commission Program Supervisor. The winners of the art contest will be awarded ribbons. The contest includes guest celebrity judges from Berks Arts Council (Karen Haver), Reading Public Museum, Reading Public Library and GoggleWorks.